As spring is here, and summer fast approaches I feel like I should be changing up what I wear. 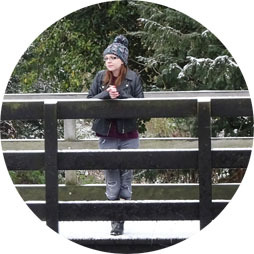 I often fall in the same rut, I wear black trousers for work and then dark blue jeans at weekends, and I feel stuck. I decided to pull out my light acid wash jeans and give them the outing they have been waiting for this year. 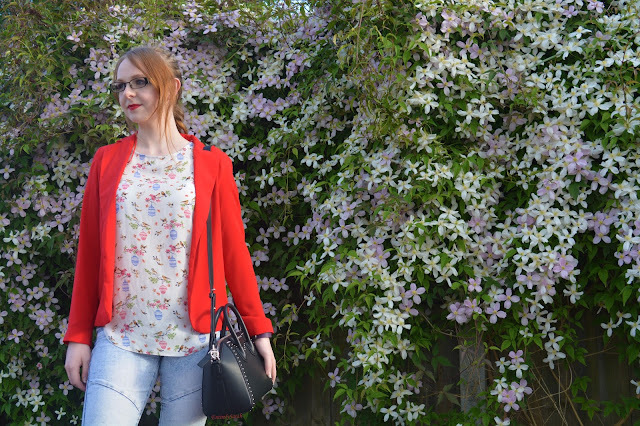 I love spring for lighter clothing and brighter colours, I really like the outfit I put together and I hope you do too! First up we have my top, this is from Primark and has cute branches with birds with little bird cages printed on the fabric. 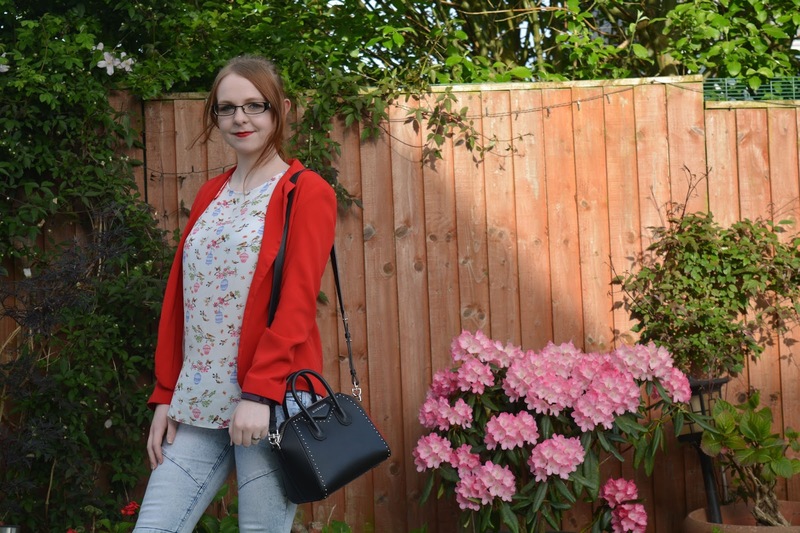 I love this top, and I know Primark have some really lovely printed vest tops in at the moment as I have been eyeing up quite a few that I wouldn't mind picking up ready for summer! 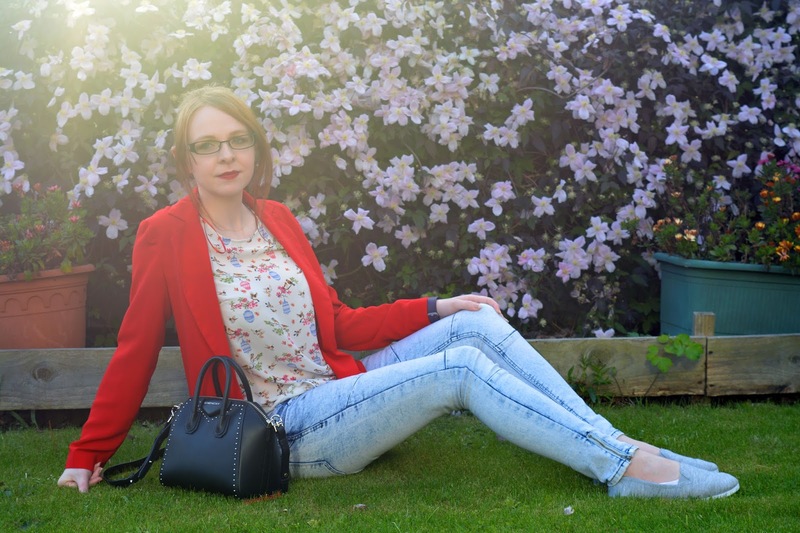 My red blazer is originally from Primark but I bought it from eBay, you can find out more about what else I bought here too. I love blazers, but my black one is wearing out from so much use, and I think it can look a little dull and boring for summer, so I have opted to get a few more blazers in brighter colours, just like this, to brighten up my outfit. My light wash jeans are from Primark also, but I bought them a year or two ago. You can however, get a lot of similar light wash ones in stores now as I have seen a lot around at the minute when I have been shopping. I am hoping to pick up a few more pairs soon as I really want to expand my jean collection for summer! My shoes, are also Primark, I'm about to break the theme I promise! These are just some slip on shoes, they remind me of either Toms or a little bit of the slip on Vans, but more like Toms. These are £3 and so comfy and really nice to wear when you don't want full trainers but you want something a that isn't boots or dolly shoes. Lets break the Primark chain shall we? My bag is the Givenchy Antigona mini studded. Lets pretend that it didn't cost a lot of money, and just revel in the glory that I absolutely adore it and would buy it a hundred times over! It is by far my favourite clothing related item I own and one that I will not be selling any time soon, even if I had considered selling some of my other designer handbags. I take this on outings when I don't need anything big, or if I am not taking my laptop as don't carry much in this when I take it out as it is my 'small' day bag. It might not be the most Spring/Summer in style, but I adore it and give it all the love I can! What is your favourite piece to style for spring summer?